I have been trying to figure this whole “craft” thing out. I see crafting tables, craft supplies, craft home centers, and craft stores. I took a youtube tour and discovered that you through crafting, you can make things look like bad work under the guise that they are a fashion statement. I have landed in the Shabby Chic world and what a world it is. As I set out to furnish the cruise ship apartment, all 390 square feet of it with only one partially underground window, I set out with a budget of a negative amount. As I have noted in other blogs we did not intend to have a basement apartment in our house. We had some space for unfinished workshops and for expansion of a bedroom and a bathroom for some future date. We had the classic unfinished basement. Enter winter. Enter rent. Enter we need a place to live. Enter money for kitchen appliances and bathroom fixtures. Enter the need for flooring. Enter the negative budget. We managed to put together a beautiful spa-style bathroom and a tiny but stylish black and stainless steel kitchen that even has a dishwasher for $3600. Top drawer all the way, we even have real stone tile in the shower. Flooring added another $800. Add labor and here we are. $10,000 for an apartment we did not plan to have. We argued, I think correctly, that rent offsets the cost in a short while, less than 6 months but it still is a lot of money a lot unexpected. We like the Cruise Ship. If you keep up with this blog you know that our little basement apartment is known as the Cruise Ship since it is about the size of a cruise ship cabin–390 sq ft. We are glad to be living at home. But, I had to find a way to furnish this tiny space on a negative budget. The only thing that we brought from our other residential sojourns was my spouse’s desk and a small chest with a build in wine cabinet. Nothing else was scaled small enough. We needed a bed, dressers, bathroom storage, living room sitting options, desk chairs that were a lot smaller than a typical one. We needed places to store our food and our dinnerware. We needed places to store electronics. We needed some rugs to cover the cold vinyl plank flooring laid over concrete. I took the precise measurements of every nook and cranny from floor to ceiling and tried to envision where we could gain storage without a negative decorating event. I looked the same to find empty floor space. Open floor space is a key to small space. We actually have a multipurpose entry way that is about the same size as the living room. When you come in you are welcomed into this entry so you have a moment get oriented before being smashed into the bedroom, the kitchen, the bathroom or the tiny living room. We have a short queen bed. A short queen is the width of a queen and the length of a regular bed. I found 16 1/6 inch wide by 15 1/2 inch deep chests. They are absolute garbage but they provide good space and a bedside table too. As long as we have them jammed into corners and we keep glue, screws and tacks handy, they are serviceable. I haunted online sales for little shelves, bathroom shelves, tiny side tables, and small chairs. My target price goal was under $40 and better at $25. The chests were $60ish. My spouse hunted down a used couch for $50 and I reupholstered it for $125. We have been waiting for the couch to fall down but so far so good. It needs some more stuffing in the cushions but we are quite comfortable. If you look at the interior of the arms of the couch you will see a crazy quilt of fabric because I was making something out of scraps because I had more couch than fabric. Unlike the couch, the bed has fallen down, twice. Event #1 happened the second day I lived here. My spouse was still on his business trip so it was only the dog and me. The legs at the head of the bed went WHUMP and we were feet up head down. She turned a half of a circle to move uphill and went back to sleep. I was so tired I grabbed all the pillows and stuffed them under my head until I was approximately level. It took me three to get around to fixing it. When my spouse came home I had addressed the leg problems but the platform for our memory foam mattress was a mismatched mottly pile of 1/2 and 3/4 inch fiber board we snagged from the leftover pile of building materials. A few days later WHUMP and all three of us were on the floor. Laughing. The multiple pieces had worked their way apart and we fell through. After that I got serious and found three pieces. I cut two of them to the same length and the third I bonded and screwed together as a structural bridge between our two pieces. In a moment of sheer brilliance, I rounded the corners of the platform. Our room is so tight that you have to move sideways rather often. Hitting a bed frame corner was not fun. Now we can just glide by with a splinter or two. We thought we had solved the storage problem by building two 8 ft long shelves in the bedroom and placing on them various boxes and bins and baskets we had floating around in out general stuff. I purchased inexpensive but still not cheap brackets for the shelves and if you can believe it, the screw holes are underneath a decorative twiggle thing so you cannot get in to drill a straight hole. You cannot do it right with a dry wall anchor or screw into the stud. On the first of our thee attempts to hang the shelves, we snapped off one of the decorative bits I will have to glue back on. Of the 12 mounting screws and 6 brackets, we have 10 1/2 half good screws and 5 brackets with support struts. The shelves are generally functional but we joked we could not put anything heavier than a frog on them. I was looking around for something decorative and got a devilish idea. I grabbed a basket and filled it with grout-washing sponges cut in half. Lighter than a frog and they actually look pretty good. The real challenge has been the proliferation of cheap “sustainable” bamboo junk. I am all for sustainable and I am all for inexpensive. The problem with cheap bamboo furniture is that it is cheaply made. Some things come with no screws or screws that have 45 degree melted bends. Some come with all the pieces but they don’t align in any planet I have visited. Some make sense but are un-installable. We had one of those tonight. It is a 14 inch towel bar and shelf and the mounting hardware included only allowed 1/4 inch beyond a 1/2 inch dry wall to hold the shelf to the wall. Bigger screws had heads too large to fit into the hanging holes. use that we cannot ever let anyone look behind the mirrors it is so awful. 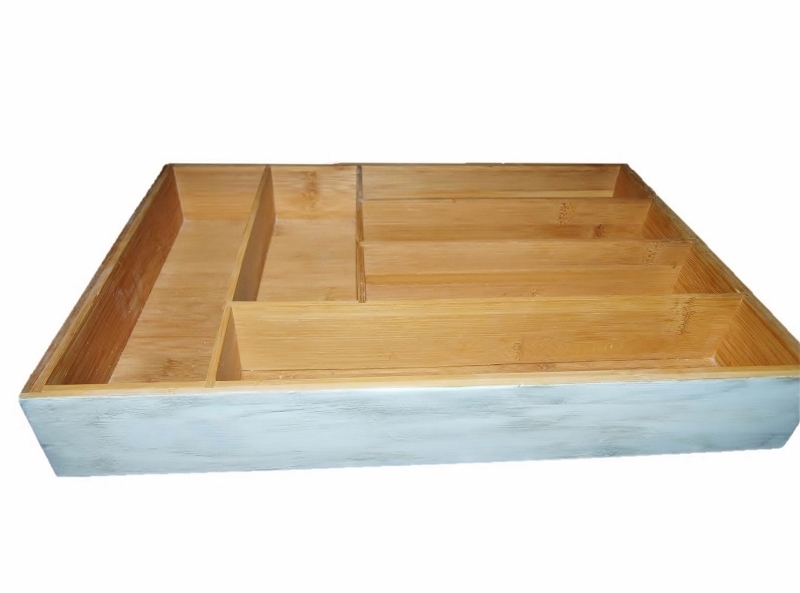 This bamboo drawer organizer in its past life was electric orange. the missing half inch, makes it look haggard and well used. It is shabby chic. In a word, my paint and my attempts to keep the budget for furnishing way down has produced a lot of pretty bad work on a lot of pretty bad furniture. Thankfully, these days you can rough it up with a little sand paper or slop some antiquing gel on it and call it a decorator style. I am glad that I can pretend my cheap furniture covered in cheap paint badly is a decorator style. I have to say it really does not look too awful.